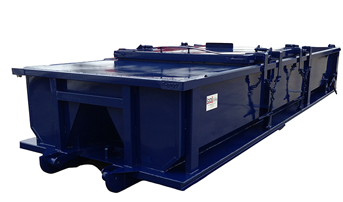 This single rolling roof sludge container allows for the easy and safe disposal and transport of liquids from job site to landfill. The CCS spring loaded rolling roof system provides one sliding roof door creating an opening of up to 86″ x 106″ for loading and a sealed tailgate for dumping. The tailgate can come in either a traditional swinging or dump door. These sludge containers can be built in a variety of size and weight configurations depending on the needs of the customer.